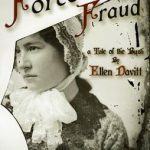 Sisters in Crime is thrilled to discover that Geelong Cemeteries Trust has created a unique walking tour of the Geelong Eastern Cemetery, called History Alive, which features Ellen Davitt, author of Australia’s first full-length mystery novel, Force and Fraud, in 1865. Visitors are guided around by actors playing the parts of ‘residents’ of the cemetery, and on the way around, visitors meet and hear stories of other significant residents who are ‘discovered’ standing by their grave. Over 1700 people have now participated in these tours. Janine McKenzie (pictured) plays Marie Antoinette Hélène Léontine Heseltine (Ellen) Davitt. Sisters in Crime has played a role in all this. 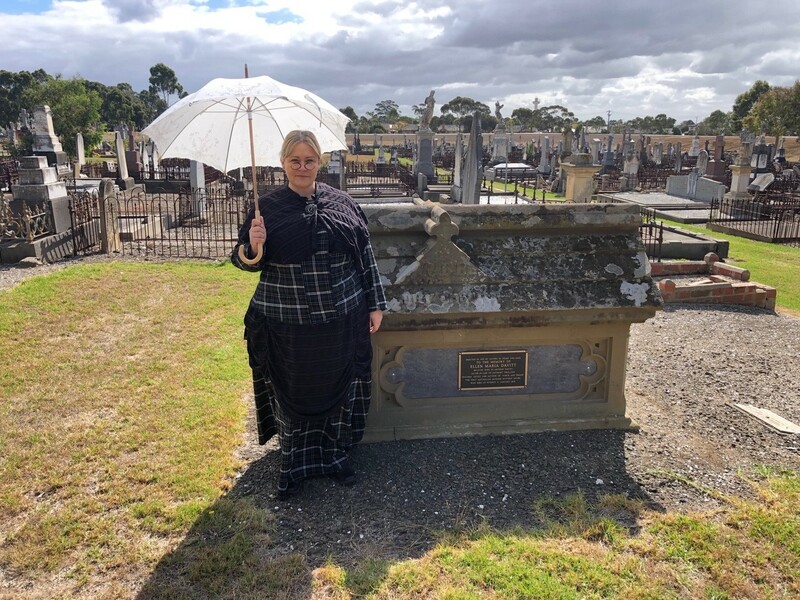 While researching her PhD, one of Sisters in Crime’s founding members, Lucy Sussex, discovered Ellen Davitt’s extraordinary achievement, and her unmarked grave in Geelong Cemetery. Born in 1812, Davitt was a Yorkshirewoman who, with her Irish husband Arthur, came to Victoria in 1854. They were teachers, and Ellen was for a time the most powerful woman in the colony’s education system. She was also an exhibited artist and public lecturer. After Arthur’s death she supported herself by various means, including writing. She composed various novels for the Australian Journal. Force and Fraud is the best, and the only crime, although she also wrote a searing story of Aboriginal massacres, “The Highlander’s Revenge”. Force and Fraud begins with a murder and ends with its solution, with various characters acting as amateur detectives. Records show that Davitt was independent and feisty (though whether that word should be used is debatable because, as Val McDermid has pointed out, it once meant ‘farting’). Davitt died in poverty, of cancer, in 1879. In 1993, Sisters in Crime organised for English novelist, Joanna Trollope, a distant relative, to place a plaque on Davitt’s unmarked grave, and Force and Fraud was reissued with an introduction by Lucy Sussex. Davitt, it should be noted, also had a criminal in the family – her father was an embezzler. Clan Destine Press re-issued Force and Fraud as an e-book in 2015. Since 2001, Davitt’s name has been immortalised in Sisters in Crime’s annual awards for best crime books. The script used in the Geelong Cemetery Tour is currently being created to a web page, so as to be utilised on self-guided walks using a QR Code for those who are unable to attend the History Alive tours. Further information can be found of the History Alive tours and self-guided tours on the Geelong Cemetery website and Facebook page. The next tours are scheduled for October.